The euro blew through its prior support level of 1.2960 easily as contagion fears grow. Bailouts don’t prevent contagions and that is what investors are deeply afraid of. Moody’s has put Portugal on review for downgrade sparking fears that there will now be TWO countries poised for same downward spiral as Greece. Fear is an aggressive behavior especially when it seeps into the core of the financial markets. Part of the reason why currencies are so trending is because when uncertainties grow, investors won’t hesitate to sell. However realistically, the risk of rating agencies downgrading Spanish and Portuguese debt to junk is minimal. Spain and Portugal do not have the same funding problems as Greece. The premium that investors demand to hold 10 year Greek debt over German bunds hit a record high of 700bp while the premium for Portuguese debt is 280bp and 121bp for Spanish debt, far below Greek levels. Yet these facts are not be enough to sooth investors who are preparing for the worst and will cringe at even a one notch downgrade. Contagion to other euro zone members. As a result, its worthwhile to take a look at the next support levels in the euro. 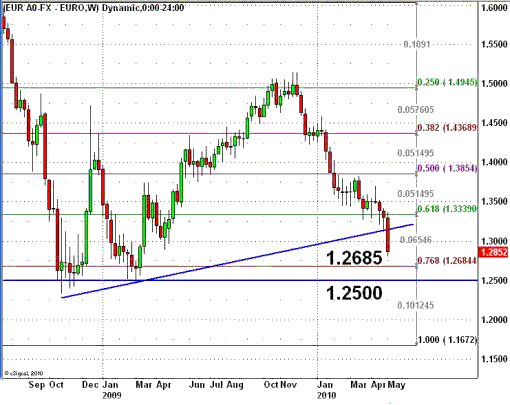 Here’s a weekly chart illustrating the strong possibility of the euro falling to 1.25. What Would Happen if Spain Leaves the Euro? Can Italy Survive the Financial Storm?